The College of Environmental Design (CED) at UC Berkeley spotlighted the innovative Oakland EcoBlock project this week, lead by CED professor Harrison Fraker and ERG chair Dan Kammen. The project, which was featured as one of Scientific American’s Top 10 Emerging Technologies of 2017, intends to adapt and apply existing renewable technologies to a neighborhood of adjoining houses, reducing fossil fuel and water consumption and lowering their green house gas emissions. The integrated systems “will produce close to zero net energy on an annual basis and reduce carbon emissions by 85%, greatly exceeding CO₂ emissions mandated in SB-32, which requires the state of California to cut greenhouse gas emissions to 40 percent below 1990 levels by 2030.” This month, the EcoBlock team plans to submit a project report to the California Energy Commission for additional funding and support, in hopes of piloting the project in Oakland as soon as possible. For more on the Oakland EcoBlock Project, click here. 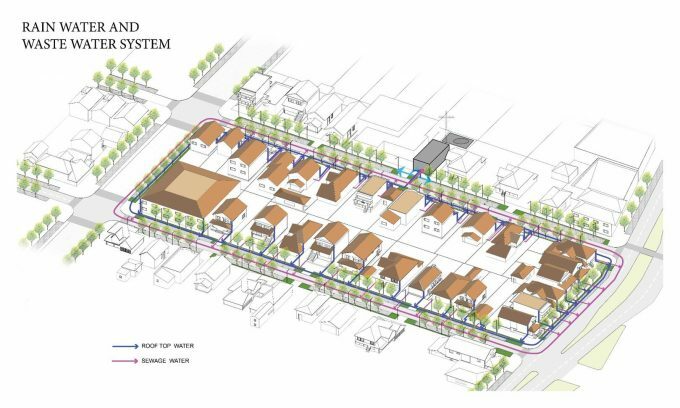 “A rendering of the EcoBlock Project indicating how the flow of grey and waste water would be managed.” Image courtesy of Harrison Fraker. Next post: What Happens When You Track Climate Change for Over 25 Years in the Rockies?